Gettysburg 150 Concerts | Gettysburg 150 Concerts is Music Celebrations International's blog for performances commemorating the 150th Anniversary of the Battle of Gettysburg and the Gettysburg Address. Gettysburg 150 Concerts is Music Celebrations International's blog for performances commemorating the 150th Anniversary of the Battle of Gettysburg and the Gettysburg Address. GETTYSBURG, Pa. — On the Civil War battlefield where President Abraham Lincoln gave a speech that symbolized his presidency and the sacrifices made by Union and Confederate forces, thousands gathered Tuesday, historians and everyday Americans alike, to ponder what the Gettysburg Address has meant to the nation. Civil War historian James McPherson and U.S. Interior Secretary Sally Jewell were scheduled to speak to mark the 150th anniversary of the speech. Pennsylvania Gov. Tom Corbett also will deliver remarks. The event comes near the end of a momentous year for the park, city and college that share the name Gettysburg, as hundreds of thousands of visitors took part in historical re-enactments and ceremonies. Lincoln’s Gettysburg Address — first delivered here nearly five months after the major battle that left tens of thousands of men wounded, dead or missing — will be read by a re-enactor to mark the anniversary. The ceremony included a wreath-laying at the Soldiers’ National Cemetery. There also will be a graveside salute to U.S. Colored Troops at noon, and a tree planting ceremony in the afternoon. U.S. Supreme Court Justice Antonin Scalia is to swear in 16 new American citizens and join Corbett a luncheon in honor of a high school girl who won a contest with her essay about the importance the Gettysburg Address, park officials said. Some visitors are honoring the speech as well as the men who fought in the battle. Tom Stack, 54, of Wilmington, Del., has an ancestor who fought and died at Gettysburg while serving with the 1st Minnesota Volunteer Regiment. “It was an incredible time, with incredible individuals, on both sides, really,” Stack said Monday. The short oration, which begins, “Four score and seven years ago,” was intended to mark the dedication of the cemetery at the site of the pivotal battle. But it also came as Lincoln’s own reasons for fighting the Civil War were evolving. He spoke of how democracy itself rested upon “the proposition that all men are created equal,” a profound and politically risky statement for the time. Slavery and the doctrine of states’ rights would not hold in the “more perfect union” of Lincoln’s vision. The ideals expressed in the speech also weren’t necessarily a reflection of reality. Only a few years after the war, a separate cemetery for black Civil War veterans was created in Gettysburg because they were “denied burial in the National Cemetery because of segregation policies,” according to a historical marker placed in 2003. The free Dedication Day event is held annually at Soldiers’ National Cemetery. Last year’s commemoration drew some 9,000 people. President Barack Obama declined an invitation. Park officials say Rutherford B. Hayes is the last sitting president to attend a Nov. 19 event in Gettysburg. There are several related events at the park this week, including the “Gettysburg Address Gallery” at the park museum and visitor center. The exhibit includes pages with signatures of individuals who attended the 1863 Dedication Ceremony in Gettysburg and a letter and signed pardon from Lincoln. The annual Remembrance Day Parade in Gettysburg will be held Saturday, featuring Union and Confederate re-enactors who will lay wreaths at the portions of the battlefield their units defended. An estimated 235,000 people came to Gettysburg this year on or around the battle’s anniversary in July. The National Park Service is streaming Tuesday’s ceremony live to 90,000 colleges, schools, libraries and museums nationwide. A rare copy of the greatest presidential speech is back on public display. One of five known manuscript drafts of President Abraham Lincoln’s Gettysburg Address will be shown at the Library of Congress until May 4. The draft, which begins with the immortal words “four score and seven years ago” and refers to “a new birth of freedom” in the latter years of the Civil War, once belonged to Lincoln aide John Hay. “It will be on display in the Library’s Thomas Jefferson Building from March 22 to May 4 as part of the ‘Civil War in America’ exhibition. “That exhibition, which commemorates the 150th anniversary of the Civil War, will be extended until Jan. 4. 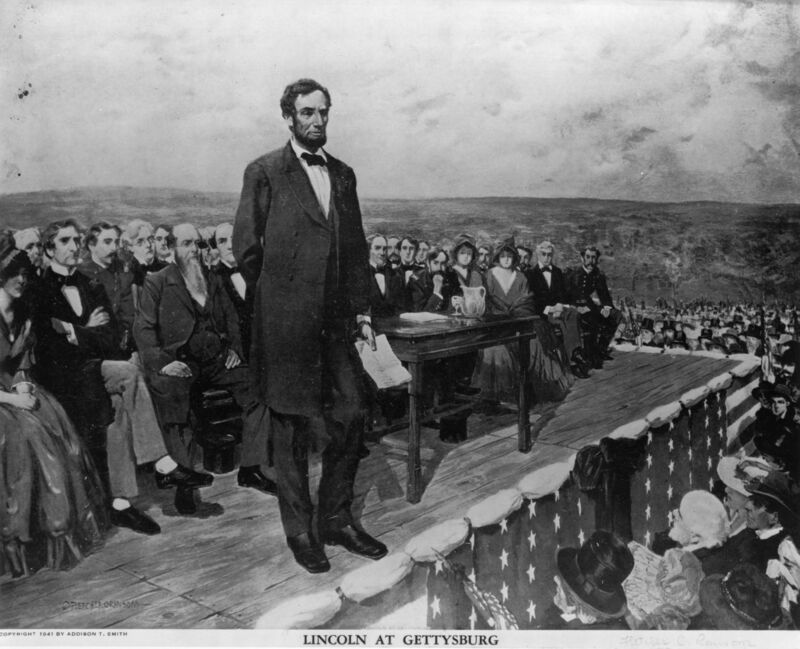 On this day in 1863, President Abraham Lincoln delivered his carefully concise yet striking speech for the dedication of a military cemetery at Gettysburg, Pennsylvania. Following the horrific loss of life at the Battle of Gettysburg in early July 1863, the overwhelming job of burying soldiers began to take place. Pennsylvania Governor Andrew Curtin immediately expressed interest in locating and burying men from his state, and was the principal force behind the establishment of the cemetery – including an invitation extended to President Lincoln to speak at the solemn dedication of the cemetery on November 19. Annually on this day, now known as Dedication Day, a ceremony marks the dedication of the cemetery and Lincoln’s Address. Earlier this morning, the 149th anniversary was highlighted by keynote speaker Steven Spielberg, Academy Award-winning director of the recently-released major motion picture “Lincoln.” No portion of the movie was shown at today’s ceremony. Dedication Day is sponsored by the Lincoln Fellowship of Pennsylvania, Gettysburg National Military Park, Gettysburg College, and the Gettysburg Foundation. Previous Dedication Day keynote speakers include Franklin Delano Roosevelt, Harry Truman, Dwight Eisenhower, Sandra Day O’Connor, General Colin Powell, and other significant dignitaries. With this rich history in mind, there is a great deal of anticipation over the 150th anniversary, one year from today. In solemn commemoration of the 150th Anniversary of the Civil War, and in partnership with Gettysburg 150, Music Celebrations is incorporating the entire 150th anniversary within our annual performance series in our Nation’s Capital – the National Festival of the States – as well as the Gettysburg 150 Music Festival at Majestic Theater on April 6, 2013. 1) learn more about this difficult part of our history. 2) perform at important and historic concert venues. 3) raise the ensemble’s profile in its community. 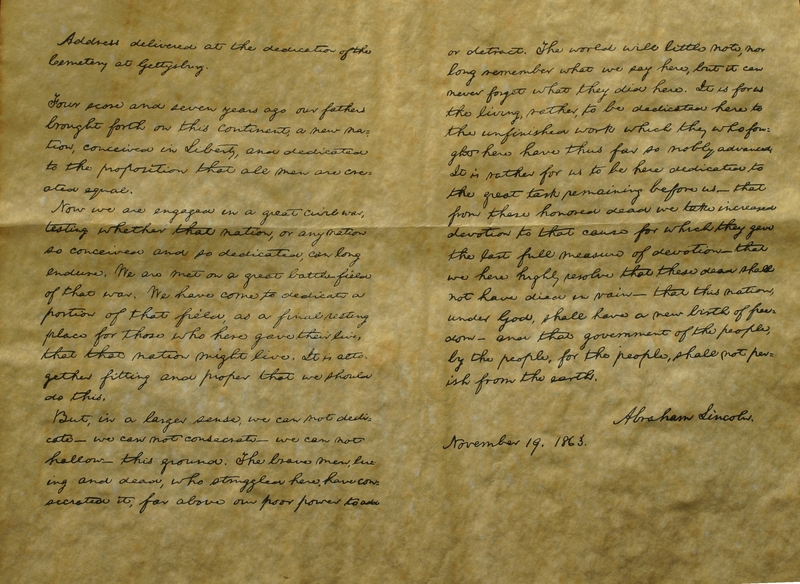 Here is the full text of Abraham Lincoln’s Gettysburg Address, as secured by Colonel Alexander Bliss – now known as the “Bliss Copy.” This text is one of only five versions of the address, is the only one with Lincoln’s name affixed to it, and is the version on the Lincoln Memorial in Washington, D.C. The first significant conflict of the Civil War on Northern Soil occurred 150 years ago today near Sharpsburg, Maryland. The result: An infamous, bloody engagement resulting in over 12,000 total casualties for the Union, and over 10,000 for the Confederacy. 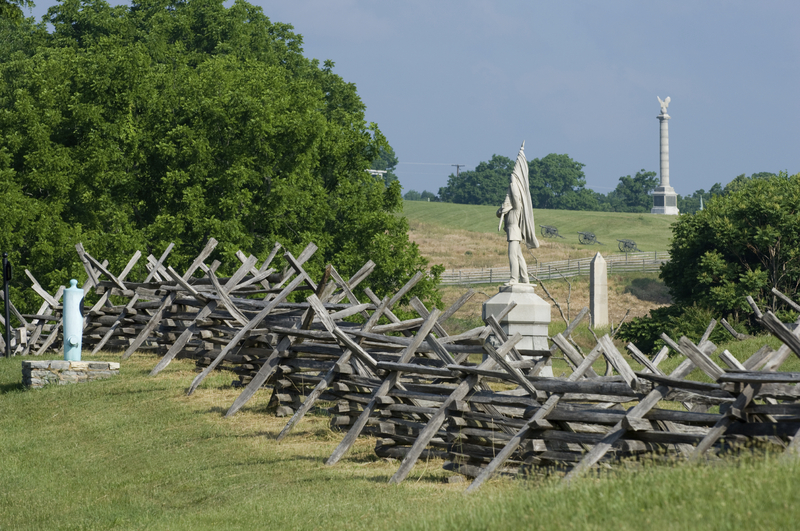 This single, bloodiest battle in U.S. history is known as Antietam. So named for a nearby creek, the Battle of Antietam marks perhaps the most significant turning point of the war outside of the Battle of Gettysburg, though the embattled men of the day would not have known this, as 12 hours of fighting ended with a virtual stalemate and unimaginable physical suffering for many who lived. Little ground was gained by either side. Initially bolstered by his success at the Second Battle of Bull Run at the end of August, General Robert E. Lee escaped with his Army of Northern Virginia the evening of September 17th, crossing the Potomac to escape further losses, though minor clashes continued the following day. This retreat gave George McClellan, commander of the Union’s Army of the Potomac, reason to claim victory – despite his greater number of total casualties, and seeming inability to effectively use all his forces to defeat Lee’s men. This perceived victory gave President Abraham Lincoln the success he had been seeking before issuing the Emancipation Proclamation. McClellan rebutted Lincoln’s insistence to follow Lee’s forces into Virginia, which resulted in Lincoln relieving McClellan of his duties on November 7th. Seemingly lost for no reason, the men who gave their lives on September 17th, 1862 – on both sides – actually gave the country much more than they could have ever envisioned – a reason for the British and French to not recognize the Confederacy as a sovereign nation; and, more importantly, by way of the Emancipation Proclamation, the first turning point in the tide of centuries worth of slavery in North America. 1National Park Service: Letters and Diaries of Soldiers and Civilians; http://www.nps.gov/anti/forteachers/upload/Letters%20and%20Diaries%20of%20Soldiers%20and%20Civilians.pdf. Accessed 09/17/2012. This serene landscape was the site of two very bloody battles 150 years ago. 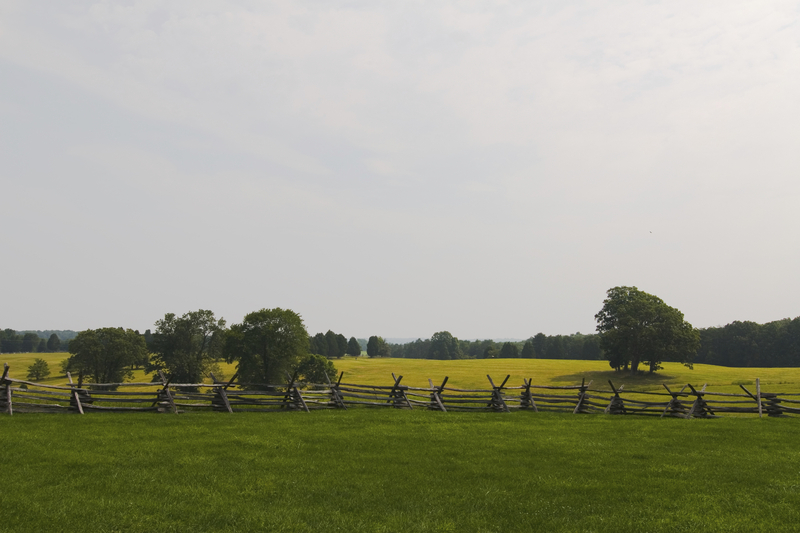 Today, much of the landscape within Manassas National Battlefield Park still retains its wartime character. The First Battle of Bull Run – so-called for the battle’s vicinity to the nearby Bull Run stream – also known as the Battle of Manassas – so-called for the battle’s vicinity to the nearby City of Manassas – took place here in July 1861, while the second battle occurred in August 1862. Today marks the 150th anniversary of the end of the Second Battle of Bull Run – also known as the Battle of Manassas. The battle was a resounding victory for Confederate General Robert E. Lee and Major General Stonewall Jackson. Union Major General John Pope was blamed for the loss, and was relieved of his duties following the battle. Out of 62,000 troops, the Union suffered about 10,000 casualties, while the Confederacy lost about 1,300 killed and 7,000 wounded out of 50,000 troops. Following this historic battle, General Lee immediately moved the Army of Northern Virginia across the Potomac River toward a fateful encounter with the Army of the Potomac in what culminated in the bloodiest battle in one day that America has ever seen – the Battle of Antietam. In solemn commemoration of the 150th Anniversary of the Civil War, and in partnership with Gettysburg 150, Music Celebrations is incorporating the entire 150th anniversary within our annual performance series in our Nation’s Capital – the National Festival of the States. On this day in 1863, the Battle of Gettysburg came to an end, and in its wake were over 57,000 Union and Confederate soldiers killed, wounded, or missing – making it the bloodiest battle of the American Civil War. Let us remember all of those who fought valiantly in this battle, and in all American battles, on this special anniversary, and on the eve of our country’s independence. 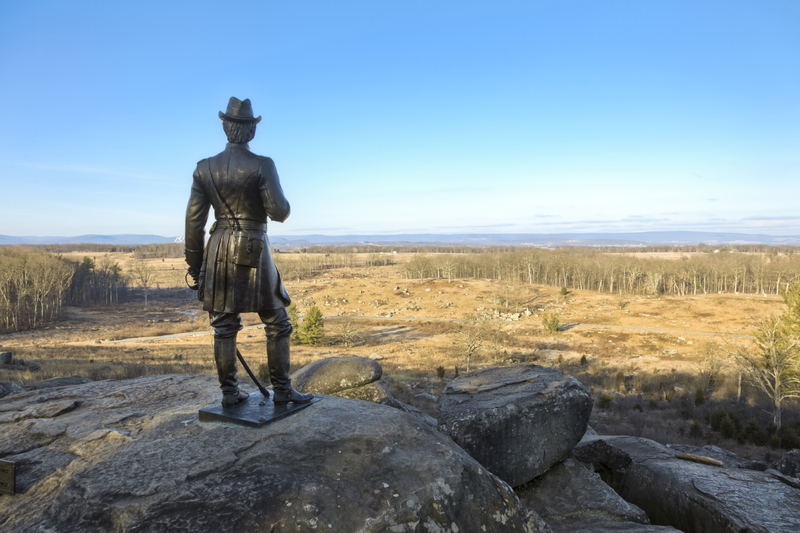 The Gettysburg National Military Park is replete with over 1,300 monuments designed to remember virtually every brigade and regiment that participated in the engagement, as well as markers that commemorate individuals and whole states worth of fighters. We came across a terrific website today that has a comprehensive listing – with photographs – of over 800 historical markers at the battlefield, and we’d like to share it with our followers. Performance ensembles that tour with Music Celebrations International as part of Gettysburg 150 will be able commemorate the 150th anniversary not only through sharing their music in Gettysburg, but also by laying a wreath at one of the battlefield monuments in honor of the those who fought so valiantly. Please peruse this wonderful site, and find out if a marker exists that’s related to an area where you live. The Pennsylvania Memorial at the Gettysburg National Battlefield. 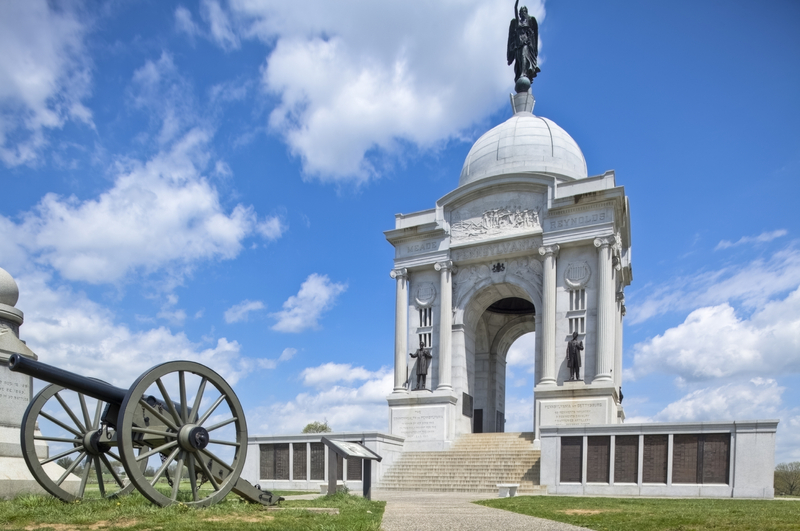 Dedicated in 1910, the monument details the names of each of the 34,530 Pennsylvanians that participated in the Battle of Gettysburg. We are pleased to announce new performance and commemoration options for music ensembles that participate in the Gettysburg 150 Anniversary. More to come! This Saturday, 200 buglers will assemble at Arlington National Cemetery to begin playing “Taps,” a call written 150 years ago this year. Retired Air Force Master Sgt. Jari Villanueva, a bugle player, says he started out as a Boy Scout bugler at about age 12. He went on to study trumpet at the Peabody Conservatory before being accepted into the United States Air Force Band — where one of his duties over the next 23 years was to sound that call at Arlington National Cemetery. Villanueva says “Taps” has taken him on a wonderful journey. “During the Civil War,” he says, “in late June and July of 1862, the Union Army is camped all along the James River, and especially at a place called Harrison’s Landing. Within that big army is a brigade commanded by Gen. Daniel Butterfield. Butterfield doesn’t like the regulation call for ‘lights out’ — that call, like most calls in the Army manual at that time, was derived from the French. WASHINGTON — The U.S. Postal Service is releasing two new stamps paying tribute to the 150th anniversary of the Civil War, specifically the Battle of New Orleans and the Battle of Antietam. The “Civil War: 1862” stamps were released Tuesday. The stamps mark the first significant achievement of the U.S. Navy in the war during the Battle of New Orleans and the bloodiest day of the conflict at Antietam. The New Orleans stamp is a reproduction of an 1862 color lithograph titled “The Splendid Naval Triumph on the Mississippi, April 24th, 1862.” The Antietam stamp is a reproduction of an 1887 painting by Thure de Thulstrup. Postal Service Vice President Dean Granholm says the stamps help Americans pause and remember a period of history that had a lasting effect on the nation.